Transposable elements (TEs) are considered to be an important source of genome size variation and genetic and phenotypic plasticity in eukaryotes. Most of our knowledge about TEs comes from large genomic projects and studies focused on model organisms. However, TE dynamics among related taxa from natural populations and the role of TEs at the species or supra-species level, where genome size and karyotype evolution are modulated in concert with polyploidy and chromosomal rearrangements, remain poorly understood. We focused on the holokinetic genus Eleocharis (Cyperaceae), which displays large variation in genome size and the occurrence of polyploidy and agmatoploidy/symploidy. We analyzed and quantified the long terminal repeat (LTR) retrotransposons Ty1-copia and Ty3-gypsy in relation to changes in both genome size and karyotype in Eleocharis. We also examined how this relationship is reflected in the phylogeny of Eleocharis. Using flow cytometry, we measured the genome sizes of members of the genus Eleocharis (Cyperaceae). We found positive correlation between the independent phylogenetic contrasts of genome size and chromosome number in Eleocharis. We analyzed PCR-amplified sequences of various reverse transcriptases of the LTR retrotransposons Ty1-copia and Ty3-gypsy (762 sequences in total). Using real-time PCR and dot blot approaches, we quantified the densities of Ty1-copia and Ty3-gypsy within the genomes of the analyzed species. We detected an increasing density of Ty1-copia elements in evolutionarily younger Eleocharis species and found a positive correlation between Ty1-copia densities and C/n-values (an alternative measure of monoploid genome size) in the genus phylogeny. In addition, our analysis of Ty1-copia sequences identified a novel retrotransposon family named Helos1, which is responsible for the increasing density of Ty1-copia. The transition:transversion ratio of Helos1 sequences suggests that Helos1 recently transposed in later-diverging Eleocharis species. Using several different approaches, we were able to distinguish between the roles of LTR retrotransposons, polyploidy and agmatoploidy/symploidy in shaping Eleocharis genomes and karyotypes. Our results confirm the occurrence of both polyploidy and agmatoploidy/symploidy in Eleocharis. Additionally, we introduce a new player in the process of genome evolution in holokinetic plants: LTR retrotransposons. Transposable elements (TEs) have been found in all eukaryotic genomes investigated . The most numerous group of TEs are long terminal repeat (LTR) retrotransposons, namely, the Ty1-copia and Ty3-gypsy superfamilies, which have become extremely abundant in plant genomes over time [2, 3]. These LTR retrotransposons copy themselves through a process of replicative transposition and are thus able to increase the genome size of the host [4, 5]. Retrotransposon insertion in close proximity to or directly into genes greatly affects gene expression and function [6–8]. Recombination between retrotransposons can cause large chromosomal rearrangements, including inversions, translocations, deletions and duplications [9, 10]. Hence, retrotransposons are an important source of genetic and phenotypic diversity in plants [2, 11, 12]. Potentially deleterious processes such as retrotransposition must be moderated so as not to have damaging effects on the host. Therefore, LTR retrotransposons are epigenetically silenced (i.e., methylated) in plant genomes  and have been under strong purifying selection pressure throughout much of evolutionary time [14–16]. LTR retrotransposons are also actively removed from the genomes of host species, although this process is much slower than retrotransposon proliferation . Retrotransposons also respond to various stress stimuli, such as environmental changes and polyploid formation [12, 17–20]. Usually, only a limited number of LTR retrotransposon families successfully populate the genome. For instance, only three families are responsible for doubling the genome size of Oryza australiensis within the last three million years , and nearly 10% of the barley genome is occupied by BARE-1 copia-like elements . In addition, BARE-1 proliferation has been proposed as an evolutionary driving force in natural barley populations [23, 24]. Most studies of TE behavior have been restricted to large genomic projects, which tend to be focused on model organisms. Little is known about TE dynamics in natural populations or among related taxa, and even less is understood about the role of TEs at the species or supra-species level, where they can modulate genome size and karyotype evolution in concert with polyploidy and chromosomal rearrangements. An appropriate model group for evaluating the evolutionary dynamics of retrotransposons on the microevolutionary scale should exhibit reasonable monoploid genome size variation within a particular taxon (section, subgenus, genus or family). Among angiosperm species in which both the ploidy level (or chromosome number) and genome size are known , one of the largest contrasts is reported in the genus Eleocharis (Cyperaceae). E. acicularis (2n = 20; 2C = 0.50 pg) and E. palustris (2n = 16; 2C = 11.05 pg) differ almost 22-fold in somatic DNA quantity at approximately the same ploidy level. This contrast is noticeable when compared with the majority of species in the family Cyperaceae, which exhibit smaller genomes. The genus Eleocharis comprises more than 250 annual or perennial species of marsh and wetland habitats . The species samples included in our study were selected to represent the genus phylogeny (all four subgenera: Limnochloa, Zinserlingia, Scirpidium and Eleocharis). Here we analyzed the evolutionary dynamics of the LTR retrotransposons Ty1-copia and Ty3-gypsy in relation to genome size and chromosome number (or size). In addition, we analyzed independent phylogenetic contrasts and signals  to determine how this relationship is reflected in the phylogeny of Eleocharis. We reconstructed the phylogeny of the analyzed Eleocharis species. The neighbor-joining tree shown in Figure 1 is based on concatenated alignments of consensus ITS sequences and partial sequences of the phosphoenolpyruvate carboxylase (ppc) gene (see Methods and Additional file 1). The topology of the tree agrees with previously published phylogenies of Eleocharis, with the subgenus Limnochloa at the base of the tree, followed by the subgenera Zinserlingia and Scirpidium, and with the type subgenus (subgenus Eleocharis) as the evolutionarily youngest taxon [26, 28, 29]. Patterns of LTR retrotransposons in the phylogeny of Eleocharis. An unrooted neighbor-joining phylogenetic tree of analyzed Eleocharis species based on concatenated alignments of the ppc gene and ITS sequences is shown. Numbers above branches indicate bootstrap values. Subgenera of Eleocharis sensu González-Elizondo and Peterson : E = Eleocharis subgenus Eleocharis, S = Eleocharis subgenus Scirpirdium, Z = Eleocharis subgenus Zinserlingia, L = Eleocharis subgenus Limnochloa. Subseries of Eleocharis: E = Eleocharis subgenus Eleocharis subseries Eleocharis. Densities (number of copies per pg of genomic DNA) of the reverse transcriptases of LTR retrotransposons estimated by both dot blot and real-time PCR are indicated by circles. Genome size, C /n -value and chromosome number (2n) are indicated by squares. Genome size was measured using flow cytometry (see Methods). For most of the analyzed species, genome size is presented here for the first time (Table 1). The somatic DNA quantities estimated for E. acicularis (Table 1) differ significantly from those reported in the Plant DNA C-values database (0.50 pg ). Therefore, we sampled seven different populations and detected no significant intraspecific variation (2C = 2.47; standard deviation = 0.03 pg; N = 7). Eleocharis palustris ssp. waltersii (2n = 38, 39) is widespread in Great Britain, whereas E. palustris ssp. palustris (2n = 16) is quite rare (see ). Thus, the value from the Plant DNA C-values database (2C = 11.05 pg, ) refers to the former rather than the latter, which is in accordance with our observations (Table 1). 1) Chromosome numbers were taken from previous studies (: E. palustris, E. waltersii; : E. sterneri because of sample identity; : E. quinqueflora because of population identity; : E. interstincta). For the remaining samples, chromosome numbers were counted by O. Rotreklová and P. Bureš (unpublished data). 2) An average of seven samples, each representing a different population (see Results and Discussion). Compared with other Cyperaceae and most other angiosperm genera, Eleocharis species vary greatly in genome size (Table 1 ). The size of Eleocharis genomes (2C) range from 0.84 pg in E. cellulosa to 18 pg in E. sterneri (Table 1), which is an almost 22-fold difference. We found that genome size (2C) is significantly correlated with chromosome number in the phylogeny of Eleocharis (2n, Figure 1; R = 0.918, p < 0.01, N = 12), suggesting that polyploidy plays an important role in generating genome size variation between Eleocharis species. This result is in strong contrast with the negative correlation found for the Cyperaceae genus Carex , in which polyploidy is considered to be very rare . Such a negative correlation was also reported as a general pattern in the phylogenetic lineage comprising sister families Juncaceae and Cyperaceae . The only exception to the observed trend is E. quinqueflora, which has a small genome (2C = 1.12 pg) and high chromosome number (2n = 136). It is likely that a similar deviation also exists in species of the subgenus Limnochloa, which are predicted to have small genomes based on the DNA content estimated for E. cellulosa (2C = 0.84 pg) and which have chromosome numbers ranging from 40 to 200 [34,35]. Nevertheless, the high chromosome numbers observed in the basal clades Zinserlingia and Limnochloa resulted rather from agmatoploidy (chromosomal fission) than polyploidy , similar to Carex (see discussion above). Thus, higher polyploids appear to belong to the evolutionary youngest subgenus of Eleocharis. The contrast in genome size between basal and younger clades of the genus Eleochris becomes more apparent if chromosome size is taken into account (Table 1). It has been suggested that symploidy (chromosomal fusion) is responsible for this pattern . However, in addition to symploidy or agmatoploidy, which are the widespread chromosomal rearrangements generally thought to be responsible for dysploidy across the holokinetic family Cyperaceae [33, 34], transposable element proliferation should also be considered (see Background). To distinguish between the roles of TEs and chromosomal rearrangements in chromosome size variation, we examined the relationship between TE density (copy number per pg of genomic DNA) and average chromosome size (C/n-value; ). The C/n-value is a species-specific parameter calculated by dividing the amount of somatic DNA by the number of somatic chromosomes (2C/2n) (Table 1). If a change in C/n is only the result of a rearrangement, the TE density in the whole genome should remain unchanged. On the other hand, if TEs are active players, their density should mirror the changes in average chromosome size. In the genus Eleocharis, the observed C/n-values increase toward evolutionary younger taxa and show a highly significant phylogenetic signal (Table 1 Figure 1). The small C/n in E. quinqueflora can be explained by agmatoploidy, whereas the increase in chromosome size in more recently diverged taxa (Figure 1; Table 1) could result either from fusion or from the amplification of transposable elements, most likely LTR retrotransposons. To assess the contribution of LTR retrotransposons to this C/n divergence, we analyzed and quantified partial sequences from both LTR retrotransposon superfamilies. We used previously described primers to isolate the reverse transcriptase sequences of Ty1-copia and Ty3-gypsy [37–39] from all analyzed species. PCR, cloning and sequencing yielded 422 and 340 partial sequences of the reverse transcriptase sequences of Ty1-copia and Ty3-gypsy, respectively [GenBank: GU976288-GU977049; Additional files 2, 3 and 4]. BLAST comparison confirmed their homology to previously described copia-like or gypsy-like elements. To determine whether species with larger C/n values carry more retrotransposon copies, we quantified the reverse transcriptase sequences of Ty1-copia and Ty3-gypsy in each species using real-time PCR with the same pairs of primers (see Methods). Because the real-time PCR approach analyzed only a subset of retrotransposons, as defined by the specific primer pairs, dot blot quantification was also carried out in selected species to corroborate the real-time PCR results. As expected, the TE densities obtained from the dot blot quantification were higher (by one order of magnitude) than the densities estimated by quantitative PCR (Table 1). The estimates of both methods were positively correlated only for Ty1-copia. However, the differences in Ty3-gypsy density between analyzed species were very small and possibly below the resolution of both approaches, especially the dot blot analysis. The calculated densities of Ty1-copia and Ty3-gypsy differed by one order of magnitude in favor of Ty1-copia (Table 1), suggesting that Ty1-copia is more successful in populating Eleocharis genomes than Ty3-gypsy. In addition, the density of Ty1-copia increases with evolutionarily younger taxa on the tree, whereas the density of Ty3-gypsy remains unchanged (dot blot) or slightly decreases (real-time PCR) (Figure 1). This pattern might be explained by the higher amplification rate of Ty1-copia (compared to Ty3-gypsy) in recently diverged species. If Ty3-gypsy remains inactive or nearly inactive while Ty1-copia proliferates, the density of Ty3-gypsy should be decreasing. A higher activity of Ty3-gypsy in basal taxa might be another reason for the resulting pattern. 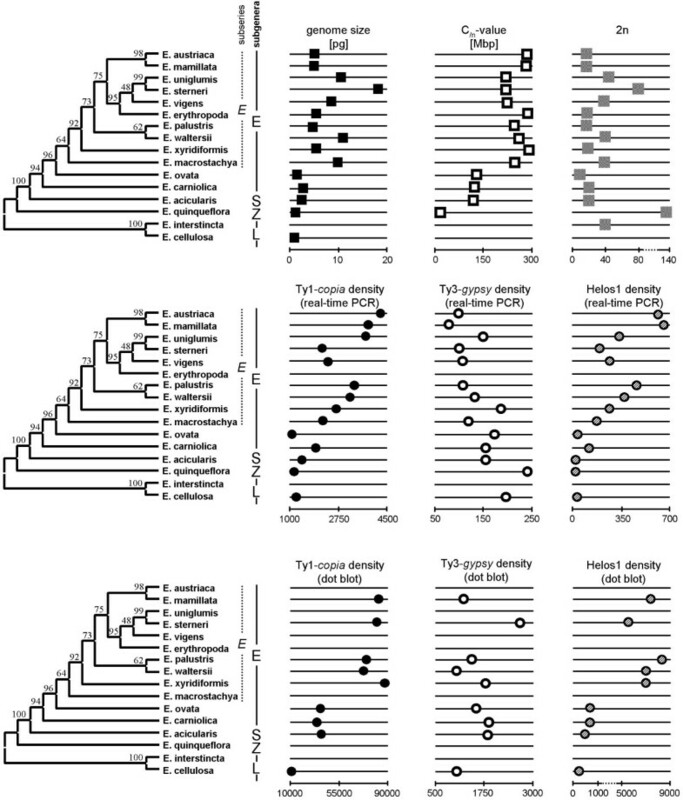 A phylogenetic analysis of Ty3-gypsy reverse transcriptase sequences revealed that 18 out of 28 (64%) sequences from E. quinqueflora formed a well-supported species-specific clade (Additional file 5). Species-specific and strongly supported (bootstrap values > 80%) clades of Ty3-gypsy with at least five sequences were also detected in E. cellulosa, E. interstincta and E. ovata (Additional file 5). The presence of species-specific clades suggests that these species underwent a burst of Ty3-gypsy amplification after diverging from their common ancestor. It is also possible that Ty3-gypsy is more efficiently removed from Eleocharis genomes than Ty1-copia. However, the preferential removal of an entire retrotransposon superfamily is unlikely. The increased Ty1-copia density in Eleocharis is accompanied by an increase in C/n (Figure 1). The phylogenetic relationship between C/n and Ty1-copia density is significant (Table 2), implying that the larger C/n-values in recently diverged species resulted from an amplification of Ty1-copia elements. This correlation is particularly apparent in species from the subseries Eleocharis, in which the doubling of C/n is mirrored by a doubling of Ty1-copia densities as indicated by dot blot analysis (Figure 1; Table 1). Our observations suggest that the activities of the Ty1-copia superfamily have a causal relationship with the C/n-value variation observed in the genus Eleocharis. The obtained Ty1-copia sequences (Additional file 6) were analyzed for the presence of putative predominant families, under the expectation that predominant families in host genomes will also be overrepresented in amplicons, resulting in a higher probability of being cloned and sequenced (see below) [40, 41]. The largest identified Ty1-copia family accounted for 109 out of 422 (26%) sequences of high nucleotide similarity (average divergence of less than 6%) and shared highly specific amino acid motifs (Figure 2). Because we did not find any similarity to previously described Ty1-copia families, this family was named Helos1 [GenBank: GU976288-GU976396]. 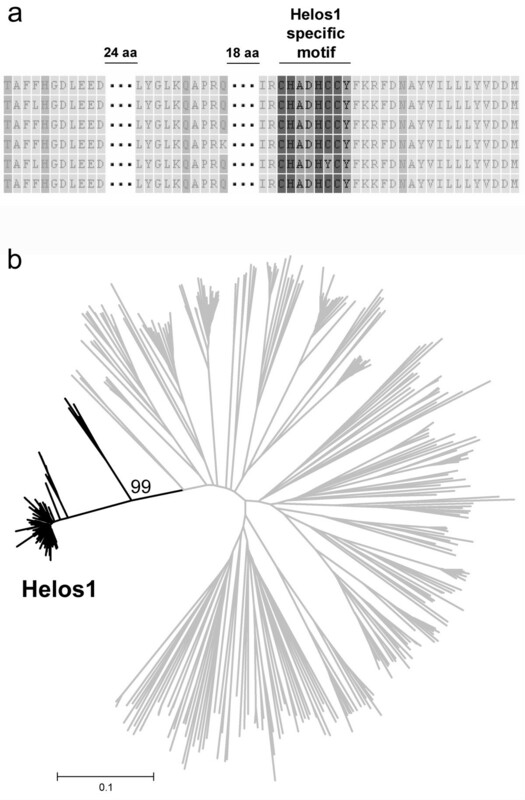 Helos1 was found in 15 out of 16 analyzed species (with the exception of E. interstincta), indicating an ancestral origin for Helos1. As a potential candidate involved in genome size variation in the genus Eleocharis, the density of Helos1 was also quantified. The highest densities of Helos1 were observed in species at the top of the tree (Figure 1), and Helos1 density was significantly correlated with C/n (Table 2). This pattern was also observed for Ty1-copia as a whole, suggesting that the higher densities of Ty1-copia found in evolutionarily younger species were caused, at least in part, by Helos1 activity (Figure 1; Table 2). Characteristics and phylogenetic position of Helos1. a - Helos1 sequences aligned on the amino acid level. The highly conserved Helos1-specific motif is highlighted. b - Neighbor-joining phylogenetic tree of Ty1-copia. Branches leading to Helos1 sequences are depicted in black. A bootstrap value supporting the Helos1 clade is shown above the branch. The scale bar indicates Tamura 3-parameter distance. Retrotransposons are epigenetically silenced when they are young (recently amplified) . Deamination of methylated cytosines leads to higher rates of transitions to thymines and elevated transition:transversion (Ts:Tv) ratios. Hence, recently transposed families/subfamilies should exhibit higher Ts:Tv ratios [16, 42]. Therefore, we calculated the Ts:Tv ratio for Helos1 in the analyzed species. We observed an increasing Ts:Tv ratio for Helos1 in recently diverged species, with the lowest value found in E. quinqueflora (approx. 1.2) and the highest value found in E. mamillata (approx. 4.1). We also detected a positive correlation between independent phylogenetic contrasts [43–45] of Ts:Tv ratio and Helos1 density (Pearson correlation R = 0.619, p < 0.05). This finding suggests that the higher density of Helos1 in more recently diverging species is due to its recent amplification. As indicated by the positive correlation between genome size and chromosome number, our results confirm previous assumptions  that polyploidy occurs in the genus Eleocharis. However, the small genome sizes and high chromosome counts observed in our study indicate that agmatoploidy is the most important process determining chromosome number in the subgenera Limnochloa and Zinserlingia. To our knowledge, this is the first study addressing LTR retrotransposons in plants with holokinetic chromosomes. Our data strongly suggest that Ty1-copia/Helos1 played an important role in the evolution of both genome size and karyotype in the genus Eleocharis, especially in the type subseries. In addition, the occurrence of both polyploidy events and Ty1-copia/Helos1 amplification is correlated with genome size in the phylogeny of the genus Eleocharis (Table 2). This relationship might help to explain why the evolutionarily youngest clade, subseries Eleocharis (Figure 1), occurs almost exclusively in temperate and boreal climatic zones, whereas the majority of genus diversity is located in tropical and subtropical zones . As transposable elements, LTR retrotransposons have the strong potential to generate genic and genomic variation on which natural selection can act to create new species [12, 47]. Although large genome rearrangements and/or TE insertions into genic regions are usually deleterious rather than beneficial, TE-induced mutations and alterations need not be adaptive to facilitate speciation. According to the epi-transposon hypothesis recently proposed by Zeh et al. , the non-adaptive impacts of TE activity can displace the population from its adaptive peak on the fitness landscape. Subsequently, a new peak is reached by natural selection, favoring beneficial non-transposon mutations [47, 48]. Because species from the subseries Eleocharis are polyploid [[35, 49–51], this study], they carry duplicate or multiple copies of all genes, and thus, the negative consequences of TE activity can be balanced [52, 53]. A greater number of TEs within a genome increases the potential to produce fecund lineages with strong abilities to evolve and adapt to various conditions [47, 48]. A relationship between the latitude and activity of the mariner transposable element has already been observed in populations of Drosophila simulans . The authors of that study discussed the possibility that the invasion of new stressful habitats triggered the activity of mariner, which subsequently produced variation for natural selection. The occurrence of polyploidy has also been shown to be positively correlated with latitude in angiosperms [55–58]. It is possible that the widespread distribution and species richness of the subseries Eleocharis in temperate zones  was enhanced by transposable elements, which have larger operational genomic ranges for creating variation for natural selection and subsequent radiation in polyploids. The above hypothesis remains to be tested. Full-length retrotransposons should be isolated and the position of their insertions within Eleocharis genomes should be determined. We believe that Eleocharis is a promising model for studying TE dynamics and genome evolution in a holokinetic system. The close taxonomical relationship between Cyperaceae and Poaceae could make these studies easier, as has been shown for the species Luzula nivea from the sister family Juncaceae . Samples were collected from wild populations and subsequently cultivated in water basins in an experimental garden of the Department of Botany and Zoology, Masaryk University, Brno. A list of sample locations is included in Additional file 7. Somatic DNA quantity (2C genome size) was estimated using flow cytometry (CyFlow SL; PARTEC GmbH) with the intercalating fluorochrome propidium iodide. A two-step procedure was performed (Otto 1 and 2; for more details, see reference ). Tomato (Lycopersicon esculentum 'Stupické polní tyčkové rané'; 2C = 1.96 pg, ) and pea (Pisum sativum 'Ctirad'; 2C = 9.09, ) were used as internal standards. Plant tissue was ground into a fine powder in liquid nitrogen, and total genomic DNA was extracted using the DNeasy Plant Mini Kit (Qiagen) following the manufacturer's protocol. DNA concentrations were determined by measuring the absorbance of the samples at 260 nm. PCR was performed to amplify a conserved region of the reverse transcriptase gene using degenerate primers for Ty1-copia [37, 38] and Ty3-gypsy , amplifying approximately 260-bp and 430-bp fragments, respectively. Amplifications were conducted in a final volume of 25 μl in the presence 50-200 ng of total genomic DNA, 1 μM of each primer, 80 μM of each nucleotide (dNTPs), 2 mM of MgCl2 and 2.5 U of PurpleTaq polymerase (TopBio) in the manufacturer's 1× PCR buffer. The following protocol was used to amplify both Ty1-copia and Ty3-gypsy: an initial denaturation step at 94°C for 2 min, followed by 40 cycles of 94°C for 30 s, 44°C for 1 min and 72°C for 30 s and a final elongation step at 72°C for 5 min. The approximately 900-bp-long exon 8 of the ppc gene was amplified with the primer pair ppc-1465F (5'-TTTGGTCTCTCTYTTGTGCGTC-3') and ppc-2338R (5'-GRCGGAAATACTCAACAAAGCG-3'). ITS sequences of approximately 700 bp were amplified with the primer pair ITS1-UBZ (5'-GAACCTGCGGAAGGATCATTG-3') and ITS4-UBZ (5'-CCGCTTATTGATATGCTTAAACTC-3'). The cycling conditions were the same for both ITS and ppc, with an initial denaturation step at 94°C for 2 min, followed by 40 cycles of 94°C for 30 s, 56°C for 30 s and 72°C for 30 s and a final elongation step at 72°C for 5 min. Amplicons were run on a 1.2% agarose gel to verify their lengths. PCR products were cloned into pCR®2.1 vectors and transformed into TOP10F' competent cells (Invitrogen) according to the manufacturer's instructions. Selection of colonies for TEs was conducted as described previously [63, 64]. Inserts of the desired length were evaluated using PCR with T7 and M13 primers. Sequencing was conducted by Macrogen, Inc.
Sequences were aligned using the ClustalW algorithm, as implemented in the MEGA 4.0 software package . Coding sequences of the reverse transcriptase and phosphoenolpyruvate carboxylase (ppc) genes were aligned at the amino acid level. If the open reading frame was destroyed due to indels, gaps were inserted to restore it. ITS sequences were aligned at the nucleotide level. All sequences were run through BLAST to check their homologies to retroelements, ITS and the ppc genes. Consensus sequences for ITS and ppc for each species were prepared in BioEdit v7.0.9.0 . The original sequences used for consensus construction are available on GenBank: ITS [GenBank: GU977050-GU977108] and ppc [GenBank: GU977109-GU977187]. Neighbor-joining phylogenetic tree of the analyzed species, based on concatenated alignments of ITS and ppc sequences, were constructed in MEGA 4.0 from nucleotide sequences using the Tamura 3-parameter model and pairwise deletion option with 1000 bootstrap replicates. The phylogeny of Ty1-copia and Ty3-gypsy reverse transcriptase sequences was inferred in the same way. MEGA 4.0 was also used to compute the Ts:Tv ratios of Helos1. Real-time PCR was performed using a Rotor-Gene 6000 thermocycler (Corbett Life Sciences). The primers for Ty1-copia and Ty3-gypsy were the same as those described above. New primers were designed for Helos1 and used to amplify the 144-bp fragment of reverse transcriptase: Helos1-F (5'-ATGTAGAGGCTGGTAAGGA-3'), corresponding to amino acid motif VEAGK, and Helos1-R (5'-ARCAGTGATCTGCATGAC-3'), corresponding to amino acid motif HADHC. Purified recombinant plasmids containing these reverse transcriptase fragments were used as external standards. Because we used degenerate primers, plasmids carrying reverse transcriptase sequences with different primer binding sites were mixed together. The mix was linearized with the BamHI restriction enzyme before being used for real-time PCR analysis. A 10-fold serial dilution of the stock solution of plasmid DNA was prepared to construct standard curves for absolute quantification. Samples were diluted to a final concentration of 3.5 ng/μl. The 20-μl reaction mixture contained 2 μl of plasmid DNA or diluted genomic DNA from the samples, 1 μM of each primer, 100 μM dNTPs, 3 mM of MgCl2, 1× EvaGreen intercalating dye and 1 U of CombiTaq polymerase (TopBio) in 1× PCR buffer. All standards and samples were measured in duplicate. The cycling conditions for Ty1-copia and Ty3-gypsy were the same as those described above. The cycling conditions used for Helos1 included an initial denaturation step at 94°C for 3 min, 40 cycles of 94°C for 30 s, 54°C for 30 s and 72°C for 30 s and a final elongation step at 72°C for 5 min. Fluorescence measurements were conducted at the end of each elongation step. A standard curve for Ty1-copia quantification was generated, covering four orders of magnitude, from 6.94 × 105 to 6.94 × 108 copies per reaction tube. The coefficient R2 and reaction efficiency (E) were estimated to be 1.0 and 82%, respectively. The standard curve for the Helos1 analysis ranged over six orders of magnitude, from 7.08 × 103 to 7.08 × 108 copies per reaction tube, with R2 > 0.999 and E = 89%. The standard curve for Ty3-gypsy quantification covered five orders of magnitude, from 1.35 × 104 to 1.35 × 108 copies per reaction tube, with R2 > 0.999 and E = 89%. Quantification was followed by a melt curve analysis to verify the reaction specificity. In all cases, a single peak was observed, indicating a single product. For the quantification of Ty1-copia and Helos1, genomic DNA from each analyzed species was diluted to 100, 50, 25, 12.5 and 6.25 ng, except E. acicularis and E. ovata, which were diluted to 200, 100, 50, 25 and 12.5 ng. In the case of Ty3-gypsy quantification, all samples were diluted to 100, 50, 25, 12.5 and 6.25 ng. PCR products prepared from the same plasmid mixes that were used in real-time PCR quantification were used as standards. These standards were diluted as follows: Ty1-copia: 3-fold dilution series from 3.27 × 1010 to 1.35 × 108 copies per dot; Ty3-gypsy: 4-fold dilution series from 5.41 × 109 to 2.11 × 107 copies per dot; Helos1: 3-fold dilution series from 3.33 × 109 to 4.11 × 107 copies per dot. Except for E. cellulosa, all samples and standards were measured in duplicate. PCR products were used as probes, which were labeled with digoxigenin-dUTP according to the manufacturer's instructions (DIG High Prime Labeling Kit, Roche). The genomic DNA samples and PCR products were denatured for 5 minutes at 98°C and subsequently immobilized on positively charged nylon membranes. Hybridization was performed using a DIG hybridization kit (Roche). The hybridization temperature was set to maintain 80-100% homology. Hybridization procedures, washing and detection were carried out according to the manufacturer's instructions. Integrated densities used for the calculation of copy numbers were obtained using ImageJ software. The presence of a phylogenetic signal and correlations between studied traits were tested based on the comparison of phylogenetically independent contrasts [43, 44]. Independent contrasts were calculated using the Analysis of Traits (AOT module) by David Ackerly, included in the Phylocom 4.1 package . All tested traits were considered to be continuous in the analyses. The original branch lengths of the phylogenetic tree were log-transformed prior to all analyses. The significance of correlation coefficients was obtained using the table of critical values for the Pearson correlation. Tests of the phylogenetic signals were based on 999 randomizations. We would like to thank Guillaume Besnard, who kindly provided primers for the ppc gene. We are also indebted to Jan Košnar for providing isolated genomic DNA from samples of Eleocharis cellulosa and E. interstincta, and to Sierra Dawn Stoneberg Holt for collecting North American taxa of E. erythropoda, E. macrostachya, E. vigens and E. xyridiformis. This study was supported by the Czech Science Foundation (project GACR 206/09/1405) and the Ministry of Education, Youth and Sports of the Czech Republic (projects LC06073 and MSM0021622416). FZ carried out DNA isolations, PCR amplifications, and sequence analyses and participated in the cloning, real-time PCR, dot blots, statistical analyses, genome size measurement, design of the study and drafting the manuscript. JŠ participated in the cloning, real-time PCR quantification, dot blots and design of the study. PŠ participated in the design of the study and statistical analyses. PB conceived of the study, participated in the genome size measurement, and the design and coordination, and helped to draft the manuscript. All authors read and approved the final manuscript.